iCal or iCalendar is a computer file format that store calendar related information like your upcoming meeting dates, your sons birthday, important reminders, etc. iCal is supported by a variety number of products including Google Calendar, Apple Calendar, Outlook. The best usage of iCal is dynamic calendar merging as it allows your very own calendar data to be synced to a product that supports iCal and you can configure your own calendar for an event submission. For example, you may export all your upcoming meetings reminder that is stored on your phone to Outlook by passing the generated iCal file. In the hospitality industry, iCal is also used as a way to sync booking calendar between Online Travel Agencies (e.g. AirBnB, LetsGoHoliday.my, Agoda, Booking.com, etc). In hospitality, similar to how iCal is used to record meeting events on your personal Google Calendar, iCal is used to store guest bookings on the property’s calendar. One iCal record will be created for each bookings and be added to the property’s calendar. To the date of writing (2019-01-31), there are some problem in calendar sync in Agoda & Booking.com. Why iCal Works for Vacation Rental BUT NOT for Hotel (yet)? iCal works very well with vacation rental / homestay / BnB because of its sync capability BUT it has its limitation when it comes to handling many rooms. iCal required a calendar for each lodge unit. In the context of hotel, for example, a hotel that has 30 units of Standard Room required to manage 30 calendars. On top of that, for it to work, the hotel reservation system is required to consolidate 30 calendars before showing the availability of Standard Room on the online reservation system. To the date of writing (2019-01-31), we are not aware of any hotel reservation system that does so. Softinn Extranet is supporting iCal calendar import from Google Calendar, Booking.com, AirBnB.com, Agoda and any OTAs that support iCal. However, until last year 2018 Agoda & Booking.com calendar seems to have problem to sync with other OTAs platform’s calendar. NOTE: The above steps mentions is an one-way calendar sync (from source to destination). For a complete calendar sync between two platforms (two-ways), repeat the same steps mentioned above BUT swapping the source the destination. The steps to get the iCal link varied between OTAs, below are the step-by-steps guides provided by each OTAs to copy the iCal link. So now you have the iCal from the source. Follow the steps below to import them to Softinn Extranet. 1. Head to Softinn Extranet > Calendar. 3. 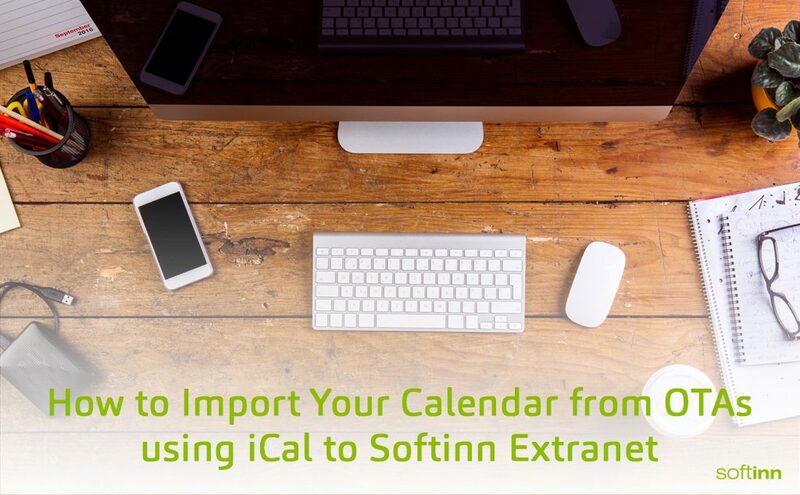 Once saved, your calendar will automatically be imported and sync. If you manage your calendar using Google Calendar, you may refer to the steps below to create a booking as well as exporting the iCal link. 1 – To the date of writing (31.Jan.2019), iCal can only be synced for Airbnb, Google Calendar, Softinn. For Booking.com & Agoda, they do not allow the syncing from their side. 2 – Date will only be auto-blocked across all platforms when a booking is made by guest directly via any OTA platform that has been synced. 3 – We support multiple sync, for example Softinn with AirBnB and at the same time Softinn with Google Calendar. Just be sure the import & export is done for both sides. 4- For those dates that you manually block (i.e. you have your own walk-in guest) on a platform will NOT auto block the same date on other platforms. Thus, those dates that you manually block should be done on ALL platforms manually & separately.